Watch the Map Cinematic for 3.1! Just one map with buildings from 85 cities all around the world. This is the biggest and beautifulest map i have ever seen! Hello i am a server owner can i use your map on my server? No problems if you give me credit. 0 HighCraftMC Hello i am a server owner can i use your map on my server? I've downloaded quite a few maps but this one is really amazing. So much work and so much detail. Very clever with the teleport buttons. You did an amazing job! One tip for others, use the elytra and a rocket, good way to quickly see the immense size of the 'city' and navigate through it. could you please add Tehran the capital of Iran? i'd really appreciate that. +6 Orangesanta8415 Love it dude, Its Brilliant! Biggest file I have ever downloaded! +6 Mr. Ducat Absolutely amazing. keep up the good work! +3 doniwicaksonoo Hi, Zeemo. 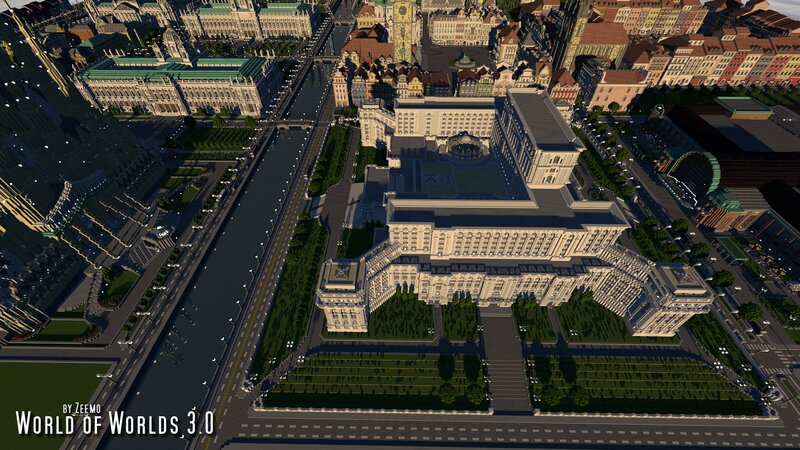 Does this map support on latest Minecraft version (1.2.1.1) ?? +1 Nolan is there San Diego? +3 Thoroma I can’t download it with a zipfile can you (Zeemo) ad another mediafire link without a zipfile. I think that will work if you put out the mods (if you have them). Because this looks really cool, but I can’t play it now. 0 xilo3g6 Astonishing guy! I would like To create my own city with some monuments you've done. I'll give you all the credit if you want. And can you give us a map of it please ? First and foremost let me say this is an amazing map, I love it! Good Work! Secondly, I am currently hosting a server for myself and a few friends to play on. Currently we have about 12 of us who play, who have played together for years. I am looking to make sort of an adventure world where there would be quests around the world etc.. (which I would be looking to use your world map for, adding npc's etc..) and having a second world (empty map) where they could do their own thing and build their own towns etc.. I have tested it out in SMP and it works perfectly but I am seeking your permssion before I upload it to my server host. Would you mind if I used your map for this purpose? I would of course give you credit in the server description and I would attempt to have any video made by anyone on my server give you credit as well. +2 Seniormapviewer Do All Of Us Have To Us 1.10.2? Good day. I was stunned when I loaded up this map for the first time. I bet you put a lot of work into this map, and I appreciate it. I had a question though? I'm a big fan of CBS The Amazing Race. It's a reality show where teams race around the world, vying for plane tickets, trains, busses, and taxis and perform area-related tasks. Would you mind if I created an Amazing Race: Minecraft map with this map? I'd give you all the credit you wanted. Faboulous builds. I love it! +6 Malcolm James Absolutely fantastic! No doubt that this would be the GREATEST city map yet. And please add Rizal Park in the Philippines maybe? Thanks, Zeemo!